Kelmarsh Hall is a graceful early 18th Century Palladian style house, set in romantic gardens and surrounded by an estate of rolling Northamptonshire countryside. The house was designed by James Gibbs and has elegant decoration by Nancy Lancaster and John Fowler which is the fashion known as the English Country House style. The new heritage lottery funded project Tunnelling Through the Past captures the lives of the servants working for a country house. The new restoration project offers a sensory experience within the Basement rooms, Hidden Tunnel and Laundry Rooms. There is also a tea room, lake and woodland walks and beautiful gardens to explore. 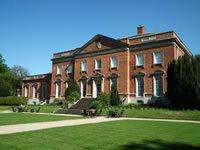 Kelmarsh Hall and Gardens are open to the public from April through to October each year.